I am now at the end of my pregnancy (I HOPE!!!!) so spending hours in the kitchen sounds less appealing to me. I get tired so easily just standing these days that I don’t want to be slumped over my kitchen counters chopping and prepping meals. It was a Sunday (so of course – Soup Sunday) and it was cold. I wanted something hearty but healthy. Potato leek soup is always a childhood favorite of mine but I wanted something lighter. 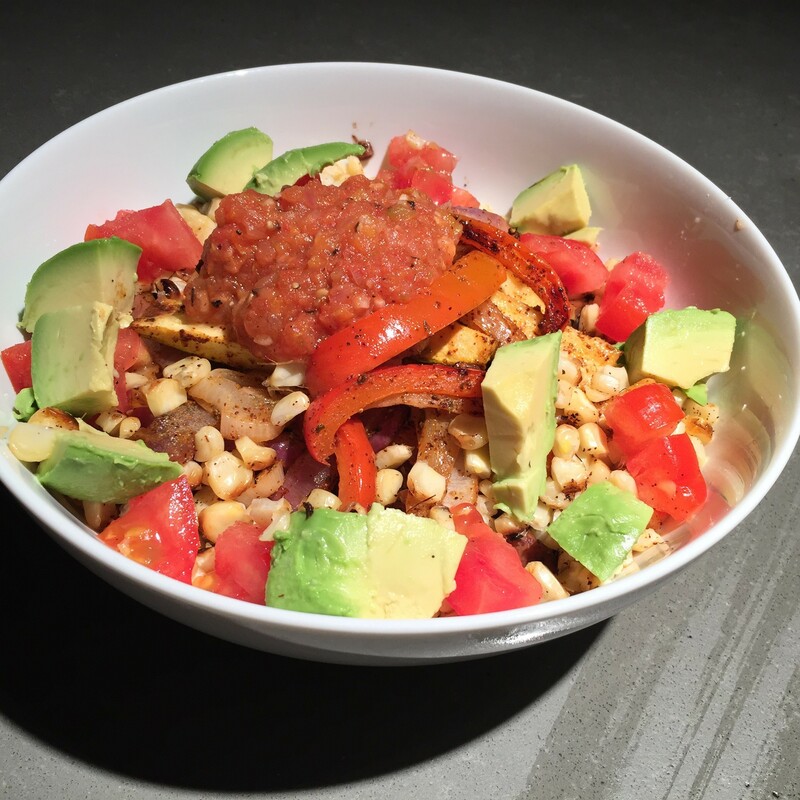 So I decided to swap out the starchy potatoes and replace it with a low carb version instead – by using cauliflower. Cauliflower is a beautiful substitute for potatoes. Cauliflower is low carb and full of vitamins and nutrients. Just google “health benefits of cauliflower” and read for yourself. I used to spend time chopping my cauliflower into florets and then most of the recipes I would wind up steaming it. What was I doing? Frozen cauliflower is already cut into florets so it saves the work of having to chop it. Especially in this soup when the soup will be blended it saves so much time using the frozen variety. Also since I am blending this soup it’s a perfect excuse to hide some veggies into it. I have made a lot of recipes where I hide the veggies. 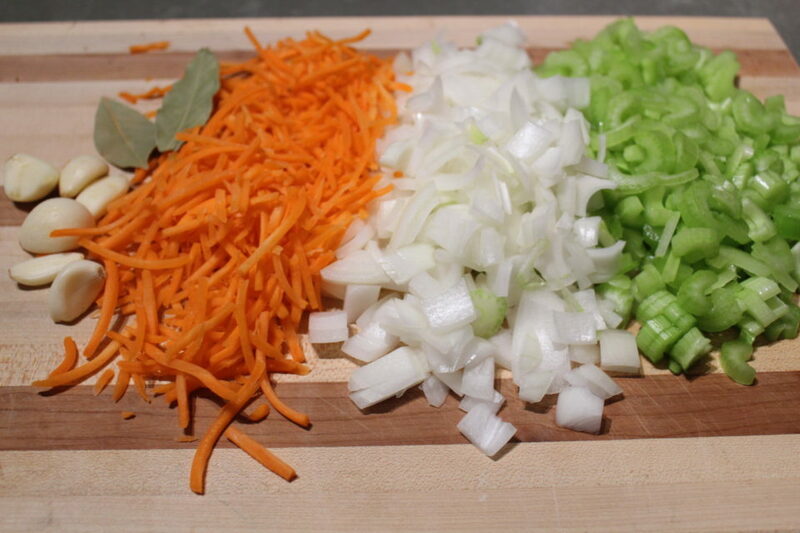 This soup has a standard mirepoix for a base (onions, celery, and carrots). For more time savers I just rough chopped the onions and celery and used grated carrots so I had one less thing to chop. 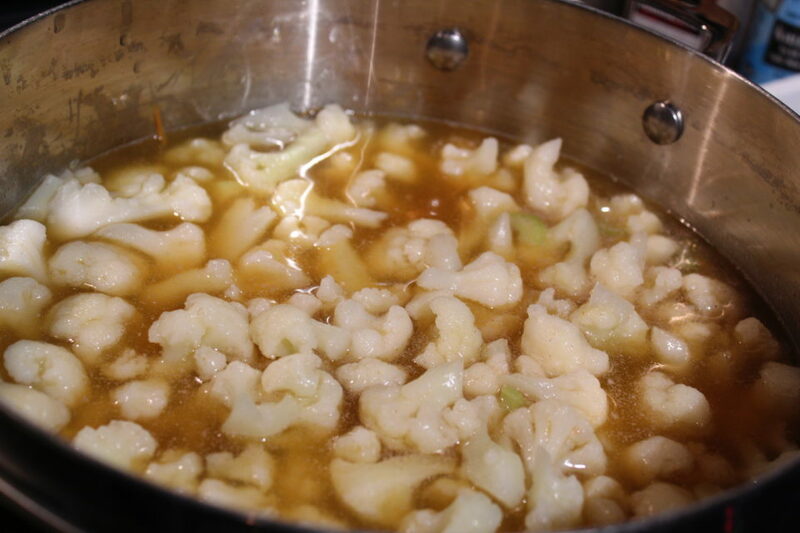 Broth and cauliflower are added once the veggies are softened. Everything cooks a little longer and then goes in the blender and voila a non-cream based creamy soup is created. 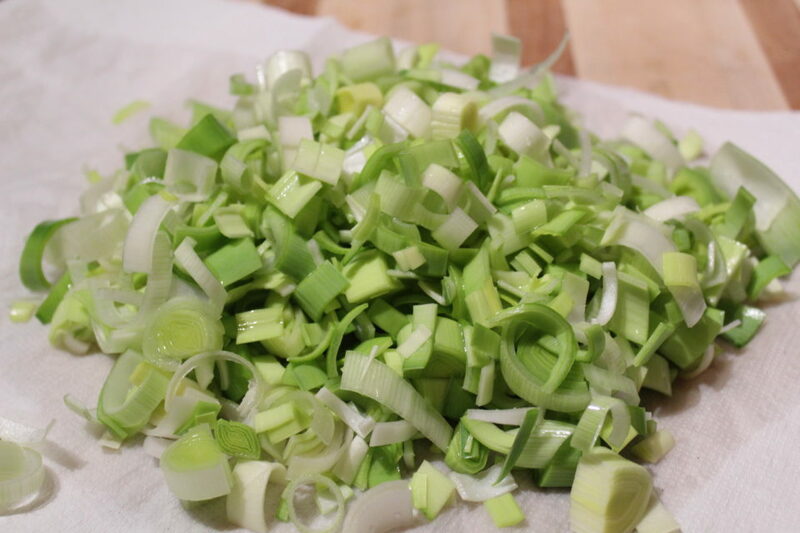 Because I do like a little texture to my soup I usually cook my leeks to the side. I cook them over low heat so they don’t burn and just soften and they can cook while the rest of the soup cooks to save time. If you prefer a completely creamy soup though, you can add the leeks in with the mirepoix and just blend everything together. You can stop there or you can get creative. 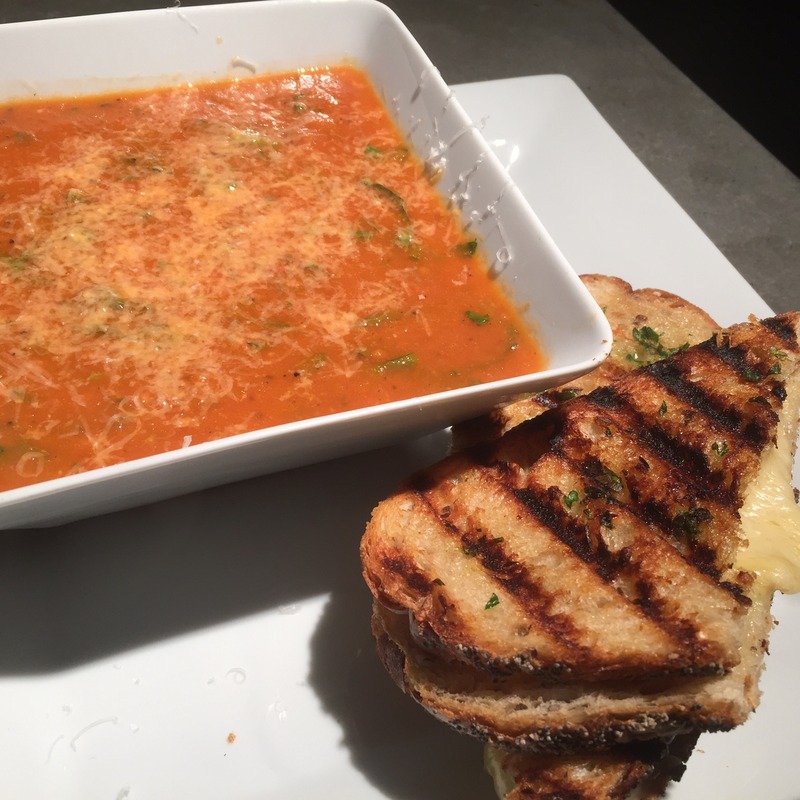 While the soup is great on it’s own it’s even better with toppings. 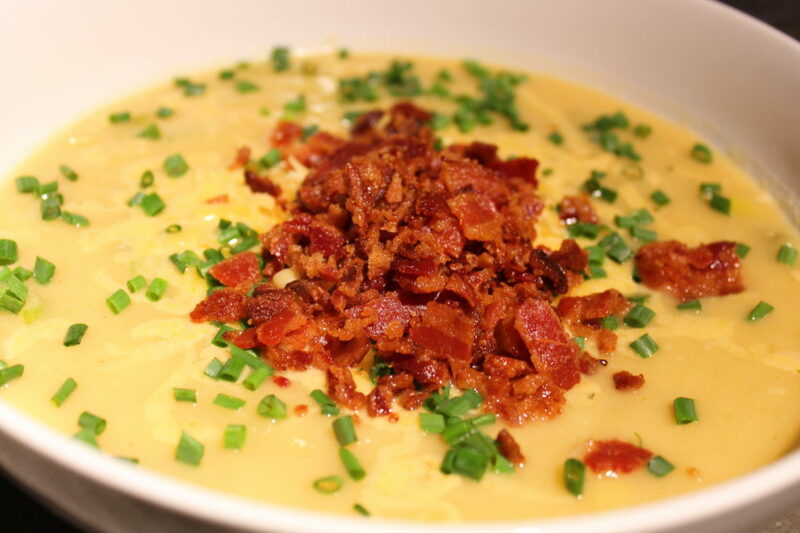 Personally I was in the mood for bacon that night so my vegetarian soup quickly went out the window when I topped mine with bacon and some cheese. The sky is the limit with toppings though, scallions, chives, tomatoes, greek yogurt or sour cream can be added for a “loaded” soup. A traditional soup like potato soup tends to be a little less waist line friendly. By a few ingredients being swapped out the calories are cut but the same great flavor is achieved. 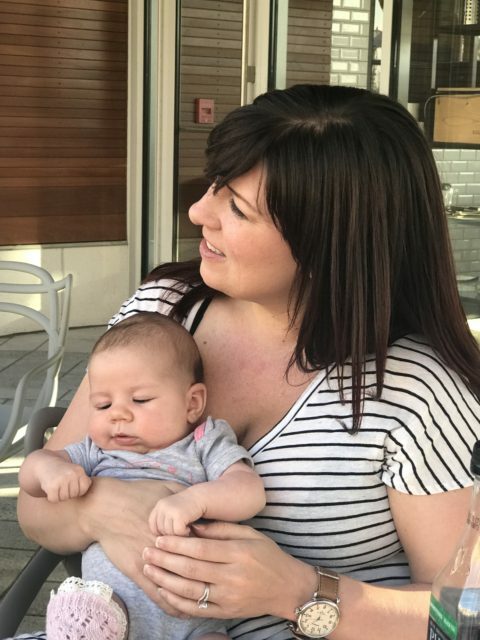 Plus the work involved in this version is minimal so it gives you less time on your feet – regardless if you are pregnant! In a large soup pot over medium heat sautee carrots, onion, celery, bay leaves, and garlic until tender, 10-12 minutes. In the mean time in a frying pan with a little olive oil sautee leeks over low to medium low heat to soften. 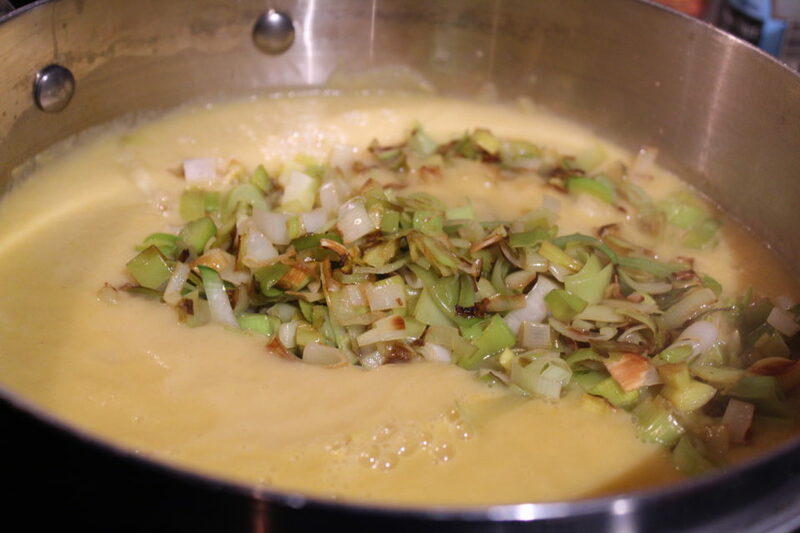 If you prefer a totally creamy soup put the leeks with the other veggies otherwise the leeks will not be pureed to add some texture to the soup. Next add in frozen cauliflower and broth to veggies, season liberally with salt and pepper. Bring heat up to medium high to a gentle boil. Let cauliflower cook 7-10 minutes. Puree soup in a Vitamix, blender, or use an immersion blender. I find a blender or Vitamix purees the soup the best. You may have to do this in batches. ALWAYS REMEMBER to vent your blender to avoid any explosions! Add puree and leeks back to soup pot. If the soup is too thick add in more broth to achieve your desired thickness. Top with any additional toppings of your liking!